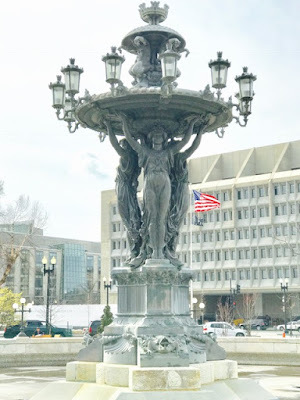 I tool this picture of beautiful Bartholdi Fountain. This statue and fountain sits between the U.S. Botanic Gardens, the American Veterans Disabled For Life Memorial, the Rayburn House Office Building, and the Department of Health and Human Services (in the background). French sculptor, Frederic Auguste Bartholdi, who designed this amazing fountain, is the same artist who made the Statue of Liberty. This 30 feet tall, 15-ton, cast-iron statue sits marvelously at the base of Capitol Hill. Next to the American Flag, this stands out as another shining symbol of our democracy, liberty, and national strength. Labels: America, Art, Bartholdi Fountain, Beautiful, Botanic Garden, Capitol Hill, Democracy, Department of Health And Human Services, Flag, Greatness, Iron, Photo, Statue, Statue of Liberty, Strength, Unify, Washington D.C.